Tanker barge Piz Palu ran aground at the Rhine river bank near Niederdollendorf in Germany. 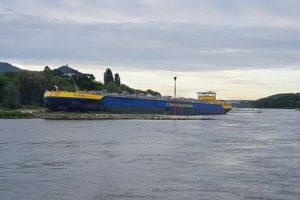 The vessel was en route from Konigswinter to Rotterdam, but was on crossing routes with barge convoy which was running river upstream to Berg. The both barges collided and tanker Piz Palu suffered three-meter-long breach in the stern portboard and ran aground into the Rhine river right bank. There were no reported injuries among the crew and no water pollution. During the collision the tanker barge Piz Palu was empty and the double hull prevented from leaking of fuel into the waters of the river. The local authorities initiated investigation for the root cause of the accident. The tanker Piz Palu will wait for high tide to be refloated. The local authorities made underwater survey and special inspection of the ship to ensure hull strength. The tanker will be freed by a tug and will be taken to a shipyard for repairs. The tanker barge Piz Palu has overall length of 110.00 m, moulded beam of 12.00 m and maximum draft of 3.00 m.